Africa is the world’s second largest and second most populated continent, with an estimated population of more than a billion people, nearly 15 per cent of the global population. Africa consists of 55 sovereign states, of which the largest are Sudan, Nigeria, Algeria, Democratic Republic of Congo, Chad and South Africa. In most cases, the borders of the existing states were arbitrarily drawn by the colonial powers, with little or no regard for geographical, historical, social and cultural factors. Many of these national borders divided groups of people and ethnic communities that had lived together for centuries. Africa is the most ethnically and culturally diverse continent with thousands of ethnic groups, languages, religious beliefs and practices, customs and traditions. Africa’s linguistic heterogeneity surpasses that of other continents, including Asia. According to UNESCO, nearly two thousand languages are spoken in the continent. Africa’s black population, who form the vast majority of the continent, is made up of thousands of ethnic groups and dozens of religious communities. In addition, there is a sizeable white population in some African states. The population of Nigeria is ethnically heterogeneous, consisting of more than 250 ethnic groups. The main ethnic groups are Hausa, Fulani, Yoruba and Igbo. About 50 per cent of Nigerians are Muslims, 40 per cent Christians, and the remaining 10 per cent follow traditional African or other religions. Nearly 400 languages and dialects are spoken across the country while English serves as the official language. The Fulani people – also known as Fula, Fulbe and Filani – are one of Africa’s largest ethnic groups with an estimated population of between 20 and 24 million. They are spread over 20 African nations, including Nigeria, Niger, Senegal, Guinea, Mauritania, Mali, Burkina Faso, Benin, Cameroon, Kenya, Sudan and Ethiopia. The majority of the Fulani – around 16 million – are settled pastoralists and farmers while a relatively smaller proportion – about 8 million – are engaged in itinerant cattle herding. The Fulani herdsmen are the largest semi-nomadic pastoral community in the world. The primary occupation of Fulani nomads is raising livestock, mainly cows and bulls. They constantly move from one area to another with their animals – a practice known as transhumance – in search of pastures and water. They travel long distances – often hundreds of miles – in search of pastures and water. Their livelihood is dependent on the sale of cattle and dairy products. They generally carry weapons to protect their herds. Sometimes their animals are stolen by armed bandits. Cattle occupy a central place in the economic and social life of Fulani herdsmen and are a core component of their collective identity. 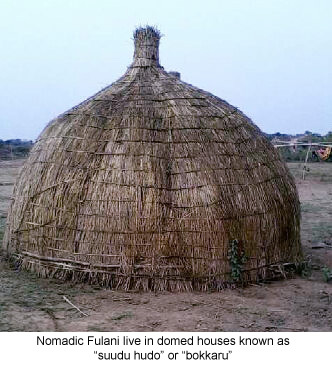 The nomadic Fulani spend most of their lives in the bush and live in domed thatched houses known as “suudu hudo” or “bokkaru.” They dismantle these makeshift houses and carry them as they move to other areas. The Fulani and Hausa, who form a separate ethnic groups, often live together and have formed tribal and political alliances. The language spoken by the Fulani is known as Fula or Pulaar, which belongs to West Africa’s sub-family of Niger-Congo group. 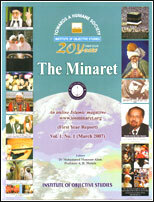 There have been many prominent Islamic teachers and scholars among the Fulani. In recent years, climate change, desertification and Boko Haram insurgency in northern Nigeria have forced the Fulani herdsmen from the North to push towards the South to find pastures and water for their animals. There has been a long-standing conflict between Fulani herdsmen – who are Muslims – and farmers – who are mainly Christians – in Nigeria. The conflict between the two groups is centred round the use of farmland, grazing areas and water. 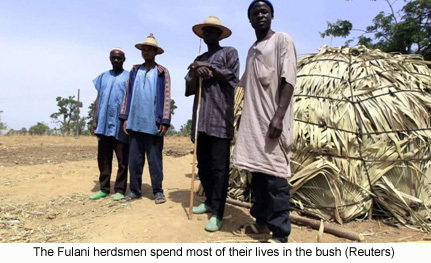 Fulani herdsmen are accused by farmers of failure to control their animals, which rampage and destroy their crops. The conflict often spills over into violent clashes in which weapons including AK47 assault rifles (which are smuggled from Libya and Mali, thanks to the porous borders), are frequently used. The conflict between Fulani herdsmen and farmers in Nigeria has resulted in the killing of thousands of people and the displacement of thousands of others. In 2014 violent clashes between the two groups took a toll of at least 1,200 lives. The clashes between Fulani herdsmen and farmers in Nigeria have cost the country more than $14 billion between 2013 and 2015.